Adrienne has a great post about women and families and getting more of them on bikes. (Thanks for the tip, Val). This is a subject I love to talk about. Stereotype or not, women, with their concerns about safety and protecting the children, need to feel safe if they are going to embrace cycling as their primary mode of transportation. Maybe it’s the red car syndrome, but I see more women on bikes every day. Women on bikes inspire other women to give it a try. Our friend Charlotte, just got a brand spankin’ new Radish from the Xtracycle sale. She mailed Tim right when the bike arrived to tell him how thrilled she is. Soon, the people of Anacortes will see one more woman with her cute kid on the back of her bike. Maybe others will join her? Trend? I hope not. I would love to believe we are all early adopters and that we are the future. Happy Tuesday, I hope everyone has a good day. This entry was posted in bigger than here, bikes and tagged Families, family, women, women on bikes. Bookmark the permalink. How about riding into your last month of pregnancy and bringing the baby home by pedicab? So very Portland! How could I forget?? ?…thanks for the reminder! Oops, Matt, I forgot you too. I’ll check out girls and bicycles too. Thanks for including us. I believe quite strongly in the power of example. People see parents commuting by bike with their kids and it makes them think, “Oh, maybe I could do that, too.” When we dove into this adventure, not being at all knowledgeable about cycling in general or family bike commuting specifically, it was so helpful to read about your and other family bike blogger’s experiences so a HUGE THANKS for that. Your welcome. It is great to look to others for inspiration. Let’s keep the momentum going! I totally agree that making it feel safer would be a huge help. People still look at me like I’m crazy for having my kid on a bike. I am very excited about the day when my son can bike on his own next to me. It is really hard work. And we do have lots of hills. What kid hauling setup are you using these days? Yes, riding with a kid on their own bike is great. We do more and more of that. We still have the kids on the Xtracycles at night, for longer trips and on when our destination requires riding on heavily trafficked roads. Hi, Anne. We had been using a trailing bike for the past 2 years but I just got a Fr8 from the Dutch Bike Co with a seat on the back for H. On the flats and downhills, I love it. But I can’t even come close to making it up the hills I could just manage with the trailing bike. I guess H was really pedaling hard! But the Fr8 is good for the cold, rainy mornings when I drop him at school because he’s a bit sheltered and protected. On the trailing bike, he’d end up muddy and splattered and cold. He’s a very focused kid and has been biking in traffic so long, I think he’ll be ready maybe next year or the year after to ride his own bike. We’re so slow on the Fr8, it probably wouldn’t take any longer…:) And there are sidewalks most of the way we could take. When did your youngest start biking on his own? Whoa, I bet you’re slow. That bike is sturdy and bomber and way cool, but heaaavy!. I’m sure riding up hills on that thing with a kid on the back is slow. Good for you! Send us a photo of the two of you. The 6 year old started way younger than his sister! She was @ 7 when she started riding in the road. He started when he was 5. The rest of the family was in the road, so he wasn’t about to be left on the sidewalk by himself! We only ride side streets when the kids are on their own bikes. And we feel no shame in respectfully (and always yielding to peds) taking the sidewalk on busy roads (like 65th). The 6 year old needs a lot more coaching than his sister. He gets distracted by all the cool stuff he sees and doesn’t always pay attention to parked cars etc. ; – ) But gentle reminders work for him so one of us always rides behind him. Hi, Anne! So, we stopped into the DBC shop on Saturday and they re-geared it for me, and now I can actually make it up hills! Well, most hills. They are so fabulous out there — love them. I’m back to loving my bike now!! We let H ride his own (brand-new birthday) bike on the B-G trail from our house in Ravenna to the DBC. He did really well but also had trouble occasionally remembering to stay on his side. Luckily it was early on a Saturday and traffic was very light. It was stupid of us, though, to go that far on his first trip. He was exhausted on the way home and had trouble riding steadily. He was a trooper, though, and no incidents. I can’t believe I don’t have a picture yet, but I’ll send one over when I do. There are, of course, many more, but here are a few of my favorites: http://www.candycranks.com/ and http://chiccyclist.blogspot.com/ and http://anadventurecalledbicycling.blogspot.com/ and http://bikelovejones.livejournal.com/ and http://bikeskirt.com/ and http://ridingpretty.blogspot.com/ and, of course http://arcticglass.blogspot.com/ though Jill is really in a class of her own. Enjoy! I think we need a page for all of these. I’ll have to add them to my google reader and check them out. Thanks! Damn, WordPress.com ate my comment twice! I seems that if someone posts while I’m still typing, my comment disappears. Or maybe comments with many links get eaten by the spam monster. 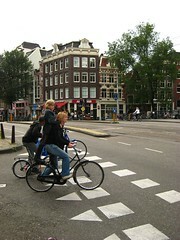 And yet another: http://cycleandstyle.com/ Mostly fashion, but some very sensible articles mixed in, too. Our blog is not bike-specific, but we do talk about our beautiful new Big Dummy and biking adventures in the Seattle area! I very much agree that family biking is key to changing the biking culture. That’s a lot of what keeps me motivated – I feel like if people see “responsible-looking” parents riding with their kids, they might see the city as a more bike-friendly place. Thus, family biking is not only something I enjoy, but also a way I try to advocate change in my community.